Make a Website make you Money! Even if you haven't any specific item to sell, a web site can still bring you a bit of extra income. There are various programmes which either give you income by 'pay per click' or commission through affiliate advertising. A web site can only be successful if there's enough people looking at it and this is the main point. You are better off starting a web site about a pretty niche subject. Type ';football' into a search engine and the amount of sites is enormous and the chances of you being high up the rankings are very slim unless you pay for it - you are about avoiding costs at all costs if you see what I mean ! So, find your niche subject and think of a suitable domain name ie www.toytrainsuk.com. The next step is to combine that with getting a company to host the site. There are many free hosting companies, but in exchange for it being free, you will usually have to carry there chosen advertising which could directly compete with yours. At present, a reasonable .co.uk domain name and hosting could cost as little as £25 per year and that's one year of getting that money back and lots more on top. It may be a static subject site where it's solely information and requires a very small amount of up-dating. So you're sitting back in the sofa thinking of the money that's coming in through your turned off PC upstairs. But most sites need regular attention and it's always advisable to have a couple of pages which visitors know change a lot and will return. Also, a forums bring people back and you could start your own little community. By putting a stat counter on all your web pages you'll see where the hits are coming from, what people typed into the search engine to find you, which pages are popular and not. By studying this over a time, baring in mind seasons etc., you'll build up a picture of which subjects within the site you want to increase and decrease in size. Building the actual site itself is made quite easy with various software programmes, some of which are free. Most of these 'build a site' programmes are a bit similar to working with Microsoft's Publisher where you type and insert pictures where you want increasing / decreasing size etc. When you have your page complete, you click a button and it will convert all the work into HTML and load it to the internet for you. 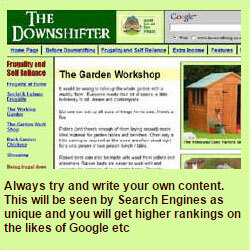 There are also free 'site submission' programmes which will put your site onto search engines for you. The main secret to being higher on the rankings is in the 'keywords'. If you're doing a page about railway engines, make sure you type 'railway engines' in a few times without it being bad grammar and the web spiders will pick it up easier and don't go off on tangents too much in a page. At worst, you'll probably just break even on your £25 per year outlay - at best, you could become a millionaire. You could have a 200 page web site and get 95% of your income from just two of those pages. Find the right subject and get heard of. If it's a local site, get the local paper to do an article on it, they're always after the 'local do gooder' bit, put stickers in your car window, get other relevant sites to exchange links. The more links on other sites to yours, the higher up the rankings you will go. Be aware though, advertisers don't like 'cheating', so choose any reciprocal link carefully and never put yourself down to a site submission 'to over3,000 search engines' etc. You'll get mountains of spam and it won't really help your quest. Just go for the big boys. You have a knowledge of tomato varieties. Finding a hosting company and build your site. The .co.uk name plus hosting will be around £25 per year.